Head to the Cash Cuisine kitchen today and uncover delicious meals to win big! It couldn’t be easier or more tasty and fun! 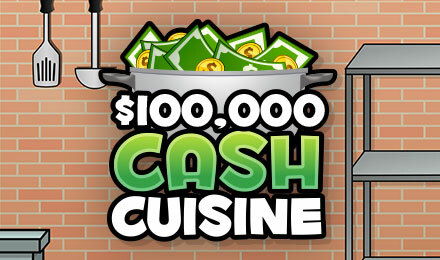 If you’re looking for some tasty wins, play Cash Cuisine online scratch card game today! With a jackpot up to £100,000, it’s simply irresistible! All you have to do is head to the kitchen and uncover 3 identical meals to win – easy as pie! Each meal is worth a different amount and will definitely satisfy all your cravings! Play now and win big! Good luck!